Defending human rights has never been a safe activity, but it’s gotten even more dangerous in the past few years. Whether it is hackers in their email accounts, or threats, harassment and persecution, or burglars in their offices, or interrogation by the security services, many front line activists face a qualified and powerful opposition in their daily work. To actively counteract this trend, Civil Rights Defenders has since 2012 conducted trainings for human rights defenders across the globe. We call our engagement the Mobile Training Centre. 2018 was an intense year for the Mobile Training Centre. 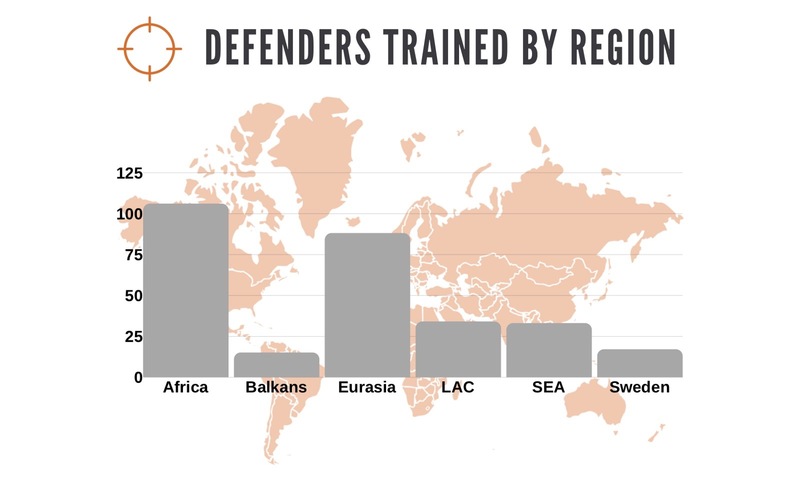 In the programme’s sixth year, it supported nearly 300 human rights defenders with different trainings. 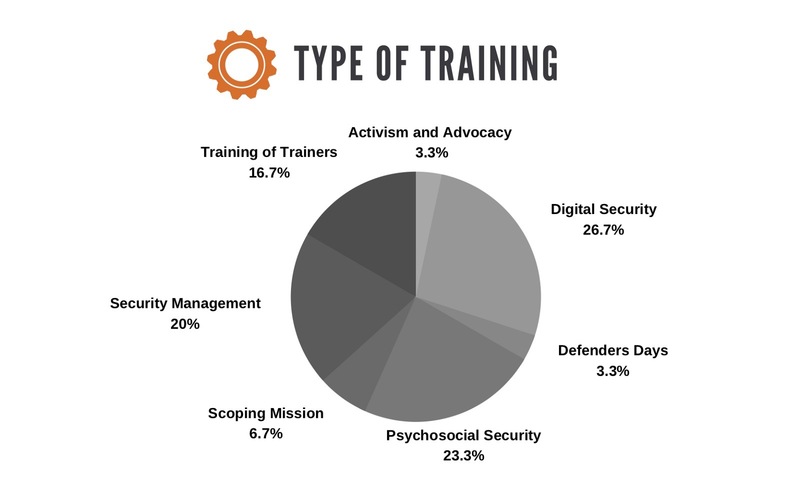 Being the historical core of the programme, the security trainings focus on digital security and security management for Civil Rights Defenders’ partner organisations, and these are our most frequent trainings. In 2018 we also continued working with psychosocial resilience trainings – covering how to deal with stress, organisational strife, and pressure from authorities — which was a great leap forward for us in how we support human rights defenders. When assessing the risks faced by human rights defenders in repressive countries, the fear and stress inherent to the environment is always one of the main dangers we identify. It’s costly for organisations in terms of staff turnover and loss of capacity, and also extremely draining on a personal level, leading to health issues, such as for example burnout. Teaching human rights defenders the skills to handle threatening situations takes some of the pressure off. Knowing that you can handle an interrogation without breaking down reduces the fear you live with day to day. In the same vein, helping organisations develop methods on how to prevent staff burnout and trauma ensures their capacity to keep working through tough times. The large number of human rights defenders reached in 2018 couldn’t have happened without our amazing global network of trainers. In order to better reach the human rights defenders with the most need for support, we often work with locals who know the culture, languages, and issues. During last year our global trainers put in some serious work — almost two thirds of our trainings were carried out by them. This has allowed us to maintain the high output of the Mobile Training Centre while simultaneously working on developing new methods and thoroughly evaluating the past five years. In 2018 we also trained no less than 28 digital and organisational security trainers. For example, this enable us to, together with our friends in Unwanted Witness Uganda, organise five digital security trainings in five different parts of Uganda, where these home-grown trainers worked with truly local human rights defenders — independent news media, land rights defenders, gender and sexual minority activists. Instead of working with a foreign trainer, these activists got to work with one from their local trusted networks. It’s impossible to overstate how much this change in methodology shifts the balance of power towards human rights defenders and away from the European and North American donors who fund the projects. Civil Rights Defenders is increasingly taking on the responsibility to not just transfer skills but also transfer the hows — how to teach, how to plan trainings, and how to evaluate their impact — to the people who have the best chance to implement it successfully year after year. During 2019 we will continue and try to do even more trainings, particularly training of new trainers to increase the local competence and expertise. Additionally, we hope to build on the advocacy and activism concept, specifically in countries where civil society organising is very difficult to achieve.